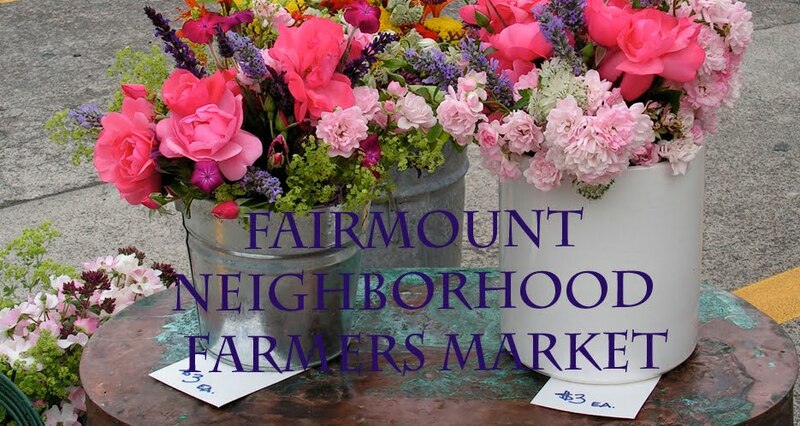 The chilly, damp fall weather is here in earnest, but we can still enjoy a couple more weeks of summer produce, like tomatoes, corn, and eggplant, and a few more opportunities to fire up the grill. If you do, be sure to throw on some eggplants, because once they collapse into charred masses, their soften insides are the perfect palette for any number of dips and salads. If it's too rainy to grill, you can char your eggplant under the broiler or directly over a gas flame, like a bell pepper, until it is blackened and soft (but avoid doing this in a hotel with very sensitive smoke detectors, as I did this summer). 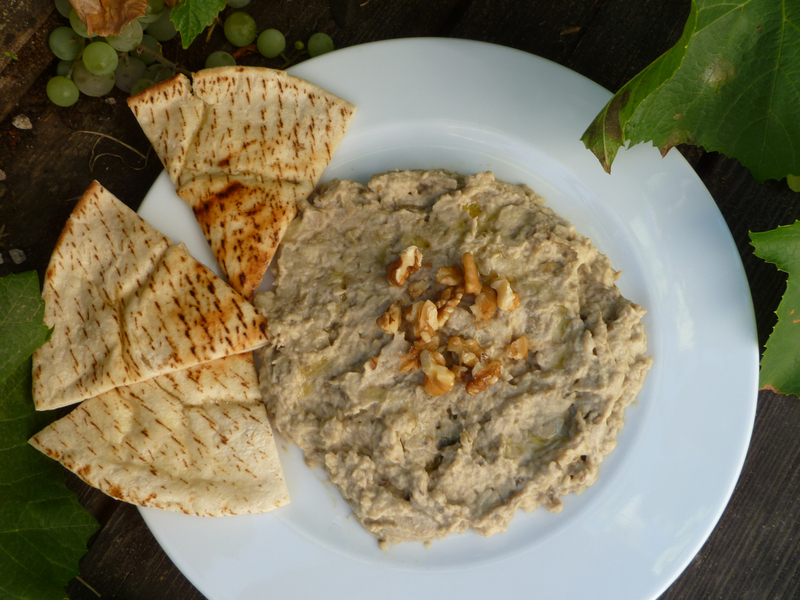 Smokey Middle Eastern baba ganoush is a delicious and familiar eggplant dip that is best shoveled with warm pita. I came across an interesting variant of this in Fuchsia Dunlop's Every Grain of Rice: Simple Chinese Home Cooking. 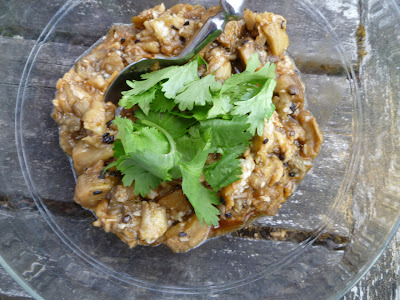 It has the same smokey eggplant and pungent garlic, the same salty tanginess (from soy and vinegar, as opposed to salt and lemon juice) and even contains sesame (seeds, not paste), but is an entirely different dish that works as a refreshing salad appetizer. 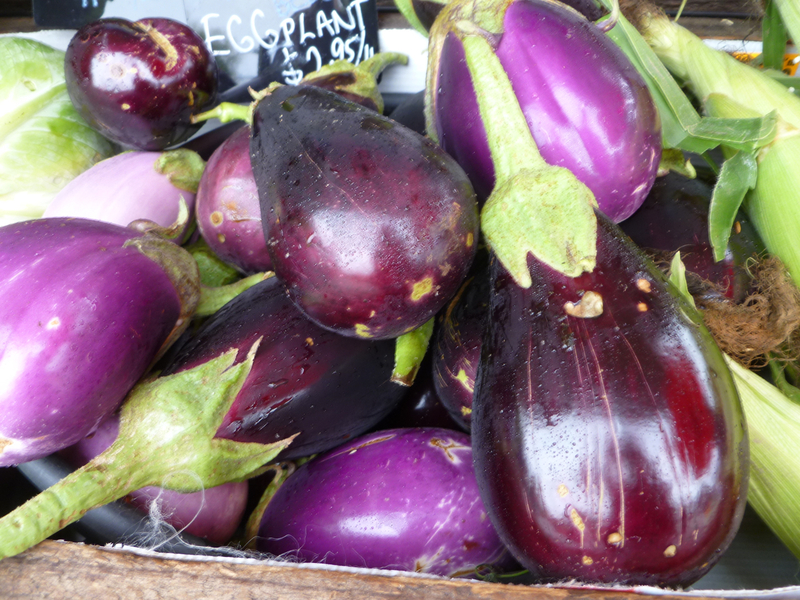 Pick up plenty of eggplants this Sunday to try both ways. 1. 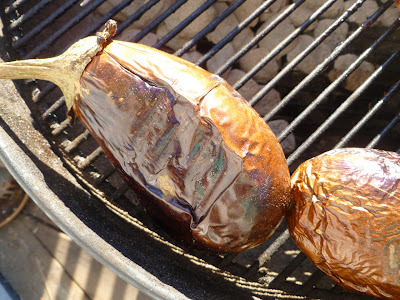 Char the eggplants on a grill or under the broiler for about 30 minutes, or over gas flames for about 10 minutes, turning with tongs, until they are completely soft and collapsed. At the same time, roast a couple of cloves of garlic in a small cast iron pan on the grill, under the broiler, or on the stove, until soft (if you don't mind raw garlic, you can skip this step). Cool the eggplant until you can handle them and then peel off the charred skin with a pairing knife or your fingers. Place the softened pulp in a strainer for about 15 minutes to drain out some of the liquid. 2. Peel the roasted garlic cloves and in a mixing bowl, mash them into a paste with a fork or pestle. Transfer the drained eggplant to the bowl and add the tahini, lemon juice, olive oil, pomegranate molasses, and a pinch of salt. Mash with a potato masher or a pestle until well mixed and the desired consistency. Taste and add a bit more of any of the ingredients to adjust the flavors to your liking. Spread out on a plate and drizzle with olive oil. Garnish with herbs or nuts if you like and serve with warm pita bread. 1. Prepare the eggplant and garlic cloves as in the recipe above. 2. Mince the garlic and dice the eggplant pulp. Combine in a bowl and toss with the remaining ingredients. Garnish with cilantro leaves if you like and serve as a salad appetizer.